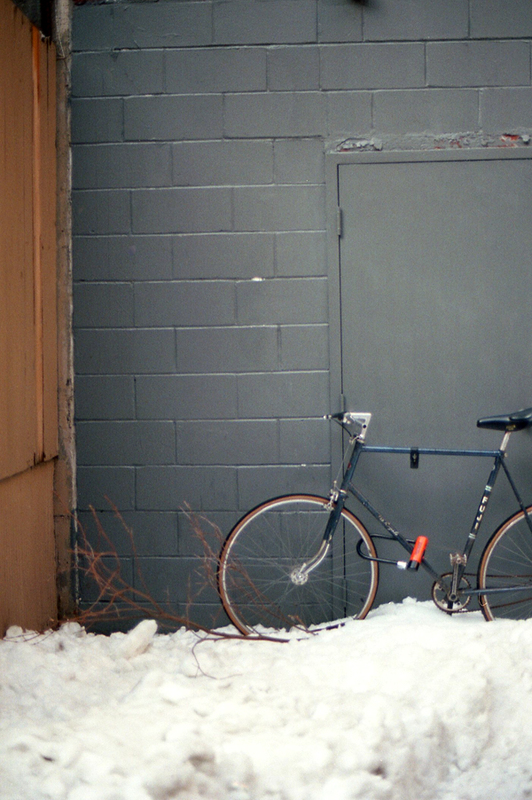 This bike shot is from the last roll, taken in Freeman alley. This is one where it isn't super obvious the focus is off. I'm also not sure how I feel about the new film. From just the results from these two rolls, I think I prefer the 400NC, but I think I will shoot off the last rolls I have in my Minolta (which should still be in tip-top shape I hope!) so I can at least have clear shots to judge from. Ah, glum is me. I really loved that camera. Awww, that is so sad! :( I'm sorry to hear this, I know if one of my film SLRs kicked the bucket I'd be way glum too. But, look at the bright side, at least it won't be nearly as expensive to replace than if your DSLR had taken the hit! That's terrible! Film SLRs aren't so expensive these days, maybe you could pick up another one? oh no! it sounds bad! have you tried to bring it to adorama? they might be able to check the lens and..who knows, do some magic with it! I'm sorry to hear about your SLR! :/ Maybe something happened to the lens, and that's why things seem a bit off?